The federal government’s $15 million investment in canola research through Growing Forward 2 (GF2) combined with the canola industry’s $5 million contribution is funding 23 research projects for five years. Some of those are complete and featured in the first half of this magazine. Here are short descriptions and progress reports for the 11 ongoing agronomy projects. 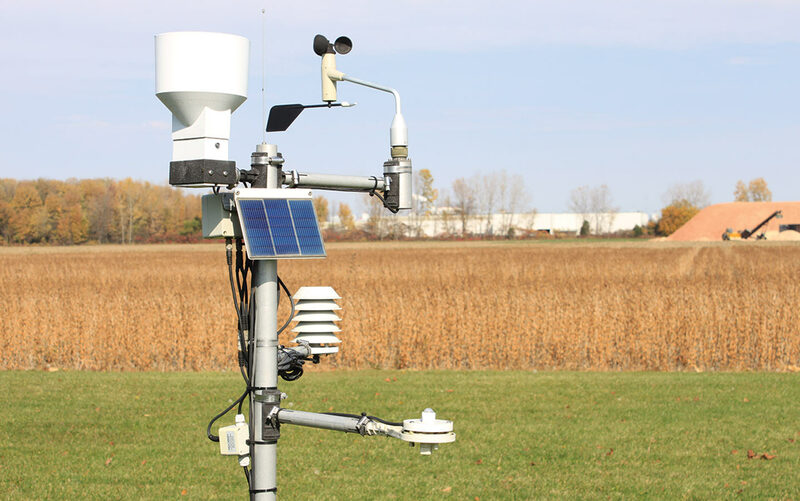 Weather Innovations uses data from these weather stations for its project on sclerotinia stem rot risk. Purpose: To better understand the physiological mechanisms of tolerance to heat and drought stresses in canola genotypes. Progress: Results from three field trials and greenhouse experiments show that measurements of pollen fertility can be used for quantifying flower abortions. Also, electrical measurements, especially root capacitance, have potential to be used as a non–invasive and rapid method for the in situ assessment of lodging resistance among various agronomic practices or for selecting genotypes with high yield potentials and strong anchorage strength in canola breeding programs. Under the controlled greenhouse growth conditions, measurements of the gas exchange characteristics (such as net photosynthetic rate, stomatal conductance, intercellular CO2 concentration and intrinsic water-use efficiency), and chlorophyll fluorescence parameters have provided insightful understanding of physiological mechanisms in the responses of canola plants to heat and drought stresses. Progress: Preliminary results indicate that some agronomic treatments (higher fertilizer rates, fungicide and chaff removal) may partially mitigate the impacts of continuous canola when they are applied sequentially over two years. However, none of these mitigation measures in continuous canola appear to be as consistently effective as simply rotating canola with other crops. Progress: Clubroot infection was determined to be the cause of crop decline and eventual death of a large percentage of plants in continuous canola plots at the Canning site in 2015. The continuous soybean rotation and soybean following wheat showed significantly lower yield than the other two rotations at the Canning site, while continuous wheat yielded significantly lower than the other rotations and the continuous corn yielded significantly lower than corn following soybean rotations at the Ottawa site. Yield of wheat, soybean and corn was not significantly affected by the rotations at the McGill site. This suggests continuous crop rotations have a tendency of yielding lower than the other rotations. Purpose: To examine the impact of variable-rate nitrogen (N) fertility programs on canola yield in areas with consistently high production, of the economic return and efficiency of fertilizer use, of the relationship between the variability of canola yield and soil test N and phosphorus (P), of variability related to soil test recommendations ​and of the correlation of digital elevation, landform and remote sensing data with canola yield. Progress: Soil and crop data were collected for nine sites in 2015-16 along with some satellite images. Laboratory analysis and preliminary statistical analyses for 2015 are underway. Yield response of canola hybrids to N fertilizer varied considerably between farms. Nitrogen fertilizer resulted in increased yields in comparison with the controls, but the response varied by farm between 50, 100 and 150% of recommended rates for the producers target yield. Purpose: This project, which builds on previously identified clubroot resistance (CR) genotypes, maps out the CR genes in the selected materials and develops markers that are tightly linked to these CR genes, in order to facilitate the introgression of clubroot resistance into canola. Additionally, the study investigates resistance mechanisms by different CR genes to help determine whether the CR genes can be judiciously used, based on their modes of action. Progress: A total of nine CR genes have been characterized based on the genetic mapping of Brassica rapa, B. nigra and B. oleracea and molecular markers have been developed for most of these CR genes. Five of the CR genes from AAFC and one CR gene from U of A have been transferred to seed companies in western Canada, along with effective markers, for the development of new resistant canola cultivars. Purpose: To investigate the host-pathogen interactions in the clubroot pathosystem in order to guide the industry, management options and resistance-breeding decisions, including providing some insights into the timing of the interaction between effectors from P. brassicae and the host. Progress: After studying one gene that appeared to be present exclusively in pathotype 5 of P. brassicae, findings suggest that it is involved in clubroot pathogenesis, and that it also might serve as a molecular marker for differentiation of pathotype 5 from other pathotypes. Other work has provided insights into the timing of interaction between effectors from P. brassicae and the host. As well, a suite of putative differential host cultivars was identified. This will be further evaluated to finalize a Canadian clubroot differential set to more effectively classify pathotypes of P. brassicae. Purpose: This study aims to provide the tools and information necessary to successfully manage clubroot in western Canada (by developing economical and effective techniques to eradicate localized clubroot infestations using soil fumigants), to assess the impact of cropping rotations and to optimize practices for disinfesting agricultural and industrial equipment. Purpose: This study aims to use clubroot surveillance to track incidence and predict the spread of clubroot, identify potential issues, monitor populations for pathotype shifts, and evaluate clubroot resistance in fields. (ID > 60 per cent) were identified in 2015, possibly due to the very dry conditions in many parts of the province in 2015. Surveillance activities have been ongoing in 2016 with data and samples currently under analysis. PCR-based testing of soil collected in Manitoba revealed the presence of low levels of P. brassicae DNA in three of 36 samples analyzed from that province. Purpose: The aim is to evaluate insecticide efficacy and timing of insecticide applications, evaluate the use of pheromone-based action thresholds and develop decision-making protocols for the timing of insecticide applications for reducing swede midge damage in spring canola. four pheromone traps per field) is recommended. However, prior to the 4-leaf stage, growers should wait until they have reached a total of 20 midges captured before making an insecticide application (beginning swede midge counts at the cotyledon stage). Purpose: The aim is to study farm-gate canola carbon footprints in each soil zone and determine the greenhouse gas intensity for canola production using best management practices in a high-yielding, high-input region. Progress: In addition to the findings reported last year, the carbon balance study comparing barley and canola portion of the life cycle assessment of canola production practices between 1990 and 2010 on the Canadian Prairies found that early planted canola was a sink for Net Ecosystem C-Exchange (NEE) in five out of five years while early planted barley was only a sink in four out of five years. However when NEE was adjusted for C-loss due to grain harvest, in four out of five years both early-planted crops were biome carbon sources (the fields on which they were grown had a net loss in carbon). Purpose: The aim is to develop models and deploy forecasting tools for canola growth stage, sclerotinia stem rot risk and canola yield on a near real-time basis. Progress: Field trials were conducted in Manitoba (11), Saskatchewan (2) and in Alberta (3) in 2015. After comparing accumulated heat units from three thermal models, accumulated physiological-day (P-day) thresholds were selected for predicting the growth stages. When growth stages prediction thresholds for short-, mid- and long-season cultivars were compared, differences among cultivar groups were determined. The newly developed sclerotinia stem rot (SSR) score card has both weather and agronomic variables as input variables and will be refined using 2016 and 2017 cropping season field data. The sclerotinia risk calculation index was also deployed at canoladst.ca for the 2016 field season in Manitoba, Saskatchewan and Alberta (and will also be refined using field data from 2016 and 2017).